Published first in: Galanaki, I. et al. (eds. ): Between the Aegean and Baltic Seas. Prehistory across Borders. Proceedings of the Internat. Conference "Bronze and Iron Age Interconnections and Contemporary Developments between the Aegean and the Regions of the Balkan Peninsula, Central and Northern Europe." University of Zagreb, 11-14 April 2005. Aegaeum 27: 91-104. Bell Beakers, where are we today? In a wide diachronic perspective the Bell Beakers are the end of a sequence of cultural phenomena that can be termed as supra-regional systems of expansion, being interpreted as ideologically motivated. Starting from the central and northern part of the European continent they gradually spread to its West and the fringes. This particular chapter of Europe's history begins in the middle of the fourth millennium BC in shape of the Cernavoda III-Boleráz and subsequent Baden sequence, proceeding – temporarily slightly offset – north of the Carpathians represented by the Globular Amphora culture, to reach its first height around 2800/2700 BC with the emergence of the Corded Ware / Single Grave cultures. The appearance of the latter is embedded in a trans-European process of transformation that from 2900 BC on shatters the previous existing material, social and economical foundations. 1 The reasons behind are complex and multi-dimensional. What certainly plays a considerable role is the intrusion of mobile Yamnaya-pastoralists from the steppes to the north and northeast of the Black Sea into the ecologically similar habitats of the western Pontic lowlands and the central Carpathian basin; an event that affects further wide-ranging changes. Meanwhile it can be dated with some precision to the same period of time. In the form of the Bell Beaker phenomenon those expansive systems reach their widest extension as now not only the continental West and Northwest, the central and western Mediterranean islands, but even parts of Africa are incorporated. Recent research again calls the Iberian peninsula the starting point of the Bell Beaker phenomenon, repeatedly pointing to the high concentration of monotonously decorated early Bell Beakers in the area of the Tagus river estuary. 2 Several new radiocarbon dates have confirmed the early assignment of the phenomenon on the Iberian peninsula – as early as 2700 BC – and therefore put it in close proximity to the transformational wave that had set the stage for the Corded Ware / Single Grave cultures. However, this might be understood in a way that the respective geographical setting and substrate will materialise in very diverse forms, also taking in exogenous factors. Expanding westwards along the Atlantic and Mediterranean shores in the early 26th century BC and reaching the British islands, northern Italy, Central Europe and the Carpathian basin around or shortly after 2500 BC, the Bell Beaker phenomenon arrives at its peak. This should also be the moment when the underlying ideology and, deriving from that, the typical Bell Beaker package is fully developed. 3 However, not a monolithic block can be discerned, but rather a patchwork of diverse Beaker groups in mutual contact. Another dimension arises from interaction with the sometimes very distinct local cultural groups: at least in the initial phase the Bell Beakers are never self-contained. It seems, that the phenomenon succeeds only in some areas in completely absorbing the autochthonous cultures. What we finally see is an impressively dynamic co-existence of different cultural systems between 2500-2200 BC, until the expansion of the Early Bronze Age establishes a whole new cultural basis. But where are the eastern boundaries of this original, and for the most part western European, phenomenon? And can we speak of a clear borderline, at all? For until very recently a few graves with the typical accompanying pottery in Małopolska and the so-called Bell Beaker-Csepel group at the Danube bench near Budapest were regarded as the easternmost representatives. In addition, Bell Beaker sherds, or imitations deriving from those, found in the Slovenian Ljubljanska Barje had been long known, as well as a distinct burial province in western Sicily as the most southeastern exponent. This distribution can fairly well be placed within an arc spanning from the 13th-20th degree of eastern longitude. But time and again, single finds from regions beyond this have been mentioned: For example, some cave finds from Romania; since the conference at Riva del Garda 1998 the dubious find from Ostrikovac at the Serbian Morava; the small Adriatic island of Palagruža; and even wrist-guards or their derivatives from Crete. In this article, 4 I will attempt to compile what is known about Bell Beaker finds roughly to the east and southeast of their actual core area and build upon that a model of systematic boundary lines. In doing so it will be of concern to find possible approaches to explain this pattern. It might come as a surprise to many that the pursuit of those most remote ‘Bell Beaker traces’ will lead as far as the Aegean Early Bronze Age. The starting point of this journey arises from several contributions of Polish colleagues on the situation in Greater Poland and along the Baltic coast in the second half of the third millennium BC. Most notably, in recent years Janusz Czebreszuk, Przemyslaw Makarowicz and Marzena Szmyt from Pozńan have systematically introduced Bell Beaker finds from the Greater Polish area in several works and put them in a wider context. 5 One of the most important results certainly was the definition of an independent Bell Beaker group that embraces the Jutland peninsula and the northern/northeastern European lowlands 6 alongside vast areas of Greater Poland. In a pan-European context it thus represents the Bell Beaker derivative of the wide North European plain. The Dutch Beaker groups are a feasible source of inspiration. Imitations are commonplace. On the Baltic coast, for instance, wristguards made of bone occur. 7 Moreover, many V-shaped buttons are worked in the regionally abundant raw material of amber. Isolated finds of those Bell Beaker elements or its imitations transgress the actual concentrations to the east and southeast. Indeed, some even believe they can recognise such finds from the eastern Baltic and Belarus. But one should act with caution, as the comb-stamp decoration technique is also in use among the foraging Pitted Ware societies. Flint daggers are as well not reckoned as being exclusive to the Bell Beaker users. Another aspect comes from the Iwno culture of Greater Poland and to a certain degree also from the Trzciniec culture. 8 In this case, we perceive the Bell Beaker elements merged with local cultural expression to form a new unity that subsequently endures, developing an own identity and later carrying the cultural phenomena of the Early Bronze Age in Greater Poland. Hence, the Polish colleagues term Iwno a ‘syncretistic culture’, a notion that will later be helpful to describe similar phenomena to the south. To sum up, in the Northern European plain we find not only a self-contained Bell Beaker group of European dimensions with a more or less definable northeastern border, but also a dispersal to even wider regions as the outposts of the Bell Beaker idea in marginal and geographically elusive areas. In contrast, Iwno and related groups are a different matter, in being ‘syncretistic cultures’, if only because they are situated inside this northeastern European Bell Beaker group. As the carrier of a new and independent identity they belong to a group of peripheral developments of the phenomenon, along with similar cultural units further to the south. This culture, well defined but mainly known by its burials, is concentrated in Małopolska, but also extending to Upper Silesia, Eastern Moravia, southwestern Slovakia and further to the Bug and upper Dnestr rivers. Syncretistic, in particular, is the common burial pottery: cups similar to the Bell Beaker’s accompanying pottery basic shape, but with a syntax of decoration as a reduction of the typical Bell Beaker motif of horizontal bands, however not worked in the typical comb-stamp technique, but in the traditional cord technique inherited from the regional substrate, or more precisely the Kraków-Sandomierz group of the later Corded Ware. This also determines the burial rite that remains entrenched in the Corded Ware traditions. Particularly in the early proto-Mierzanowice phase which remains restricted mainly to Małopolska, we perceive further Bell Beaker elements, above all the wristguards as in the graves of Swiecice, burial 3, and Cracow-‘Kopiec Wandy’, burial 11/63, but also the typical flint arrowheads with an intruded base. In the eastern Moravian distribution zone burials of the Bell Beaker East Group, the second phase of the ESKK and the following fully Early Bronze Age Nitra group (Reinecke A1), are all represented at the cemetery of Holešov, district of Kroměříž. 10 With little stretch of imagination, the Upper Silesian-Malopolish Bell Beaker province that must have derived from the migration of smaller groups of human beings from the middle Bell Beaker A2 phase from the Moravian core area of the East Group is most likely to have inspired these occurrences of Bell Beaker elements. So, another trait of those syncretistic cultures and eastern Bell Beaker-peripheries becomes apparent: their younger chronological assignment by one or perhaps two centuries compared to the emergence of the Bell Beaker core areas. These patterns recur following the geographical longitude that joins Iwno and ESKK further to the south. Two other archaeological cultures, both regionally and historically classified as Early Bronze Age, also display elements of the Bell Beaker ideology and the package in their repertoire: the Pitvaros/Maros, mainly east of the Danube on both sides of the river Maros/Mureš, and the proto-Cetina/Cetina concentrated along the Dalmatian coast, but also reaching beyond this. Due to its many single grave cemeteries with often lavishly equipped burials, the Pitvaros/Maros group 11 has received much attention by Central European scholars concerned with the Early Bronze Age from early on. Emil Vogt's Blechkreis (1948) may be recalled as the first attempt to put all the Early Bronze Age cultural phenomena along the Danube in a systematic order by means of their copper jewellery and technology; or Walter Ruckdeschel's chapter V.1 on Early Bronze Age burial rites in a far-reaching comparison (1978, 311ff.). Both 12 regarded Pitvaros/Maros as the only Carpathian representative that is closely connected to the Central Danubian Frühbronzezeit (Singen, Straubing, Linz, Unterwöbling, Leithaprodersdorf) in terms of grave goods and burial rites – that themselves can be continuously deduced from their Bell Beaker foundations. Yet it is the early phase in particular, dated to the Early Bronze Age IIa in the Hungarian terminology, when those Central European relations and the very Bell Beaker impact become clearly visible. This applies particularly to the Maros burial ritual: a bi-polar gender differentiated, predominantly N-S oriented scheme in which both gender face East, the men lying on their left, the women on their right side. This perfectly matches the typical scheme of the Bell Beaker East Group, although the next core area in form of the Bell Beaker-Csepel group lies several hundred kilometres to the northeast. The same relationship is shown, for instance, on the recently excavated cemetery of Kiskundorozsma near Szeged, Kom. Csongrád, close to where the Maros flows into the river Tisza, that again represents a very early Pitvaros/Maros. 13 All graves are oriented and endowed with respect to gender, the pottery shows unequivocal references to the earliest Unterwölblinger area, especially to the Jois-Gollensdorf horizon there. This relationship also appears at the man's burial No. 66 that is clearly part of the Bell Beaker tradition, containing the combination of an early riveted dagger and a two-holed wristguard. That is complemented by other single finds of wristguards that cover the middle Tisza area with the well-known finds of Tószeg and Dagyrév (both Kom. Szolnok) and the southern midlands between Danube and Tisza with the more recent plates of Soldvadkert (Kom. Bács-Kiskun) and from the ‘Museum Kiskunfélegyhaza’. Taking in the Bell Beaker dwelling site of Mezökomaron, as well as ‘pit J’ of Börzonce with its obvious Bell Beaker relations, also central and southwestern Transdanubia gets drawn into this far-flung zone of influence. More finds of this kind can be expected in the coming years. In contrast, the Pitvaros/Maros group is differently structured, if only due to its chronological position. Again one or two centuries after the (spatially) nearest Bell Beaker core group, it corresponds very well with the gradations of Iwno and ESKK. This, too, applies to the syncretistic character among which the Bell Beaker elements are particularly discernible in the early phase, but starting to wane when the Carpathian surroundings – that have a more reserved attitude towards those Bell Beaker elements – become dominant. Continuing south to the Proto-Cetina/Cetina group we are leaving the influence zone of the Bell Beaker East Group and enter the one of the Central Mediterranean Bell Beakers (Fig. 1a). Their heartlands are on the one hand northern Italy and Tuscany, on the other hand Sardinia and western Sicily. Bell Beaker elements in Proto-Cetina/Cetina are by no means a new assertion and have repeatedly been emphasised. 14 As in the case of Iwno, ESKK and Pitvaros/Maros they are displaying several find categories: wristguards are known both in some numbers and as single finds, coming from settlements and graves. Published sites are: Bitelić, Čitluk, Ljubomir, Mala Glavica, Ravlića Pećina and Sinj. Quite a few more might be yet unpublished. As a result, in that area there are conspicuously more wristguards than, for example, in northern Italy or the Bell Beaker-Csepel group. Almost all recognised types occur and range – from a Central European perspective – from the Beaker period to the Early Bronze Age. This also applies to some triangular riveted daggers and, particularly, to the collection of gold jewellery from Nin-Privlaka among which two small V-buttons cast in solid gold, as well as several golden Noppenringe are (still) present. This assemblage obviously constitutes the remains of a formerly rich grave inventory, possibly from a mound and dating to the third quarter of the 3rd millennium BC. 15 Its Bell Beaker elements and their execution in gold – incidentally, the only of their kind in the whole of Europe – illustrate the intrusion of those elements up to the highest social strata and make them part of the latters' prestigious status commodities. Moreover, the many undecorated bowls, jugs and cups can be added to those elements. Without stirring much attention they could be hidden among the accompanying pottery of the East Group and the north Italian Bell Beaker province. In contrast, the Eastern Adriatic region lacks genuine Bell Beakers. Their sherds can be traced as far as the head of the Adriatic and the karst lands around Trieste; beyond that only two imitations or ‘beaker derivates’ are known: one beaker from Ljubljanska Barje and another from a grave assemblage in Kenëte, Albania. 16 Both demonstrate contacts to the Adriatic variant of the Vučedol culture, in case of the beaker from Slovenia indicated by its context; the Albanian one is actually a strange blend of basic beaker shape and Vučedol ornaments that also feature rudimentary zonal ideas. Still, the Bell Beakers are strongly underrepresented compared to the other categories. The more so, as some of the sherds, that have been repeatedly mentioned in this context, appear to be rather fragments of classical Cetina vessels. Therefore, the finds from the small Adriatic island of Palagruža published to date might represent the very beginnings of the Proto-Cetina development. Here, the Bell Beaker elements are predominant: several fragmentary wristguards, along with comb-stamp decorated pottery sherds showing a Bell Beaker-like decoration syntax and, finally, a flint inventory that comprises many of the characteristic arrow heads featuring all the common types of Mediterranean Bell Beakers. 19 Palagruža does also play a crucial role in terms of geography, not only for its yielding flint deposits – otherwise rare in the Circum-Adriatic region – but also as a central hub for an ‘island hopping’ from Dalmatia and its off-shore islands of Vis-Lastovo-Sušac to Pianosa, Tremiti and further on to Apulia on the other side; or just the other way round. This indicates another route besides the connection to the head of the Adriatic, on which Bell Beaker elements could have entered into Vučedol and Proto-Cetina assemblages. Then again, we now know of about twenty-five Cetina sites on the Italian side. Thus, it comes as no surprise that in southeastern Italy another Bell Beaker periphery has emerged. Those approximately twenty-five sites comprise the whole northern and western Adriatic shore and stretch from Trieste in the north to the ‘heel’ of southern Apulia with concentrations around the Daunia peninsula and the Apulian plain. 20 Moreover, at least the related pottery of the Corazzo-Zungri settlement site provides evidence for an extension towards Calabria. Only single findspots are situated further inland. Associated with this is also the northernmost site of Montesei di Serso (province of Trento) to date. 21 The context of the Italian Cetina finds could not be more different: it ranges from pottery sherds and supposed pottery depositions from settlement layers in several caves of the Trieste karst; 22 and mostly single finds of vessels from ‘indigenous’ settlements of the second half of the third millennium BC; to settlements that apparently produced preponderantly Cetina pottery (arguably Rodi Garganico and Rutigliano-Le Rene in Apulia); as well as graves with mixed assemblages as representatives of the traditional Apulian burial rite in caves and grottoes that usually contain only one or two Cetina vessels. The latter becomes very clear in the case of the artificial grottoes with multiple burials of Casal Sabini, tomba 1, Laterza, tomba 3, and Pisciulo, ipogeo 2. 23 The fragmented state of research and the limited number of significant and closed finds, however, do not allow for considerations about the intensity, quality or even nature of the Cetina impact or their settlement along the western Adriatic coast. In terms of chronology, the majority of finds seems to be of the classic Cetina jugs (e.g. Casal Sabini and Laterza). Then again, stamp and puncture decorated potteries occur, regarded as being early even in the eastern Adriatic region, as shown, for example, by plates and bowls with banded under-rim puncture decoration combined with a similar rim decoration on the broadened rim (see fig. 2b). First choice as the local partner in Apulia is the Laterza culture, or its presumably younger facies of Laterza-Cellino San Marco. In the Marche region adjacent to the north, this role is played by a regional group named Conelle. 24 Both have their roots in the late fourth millennium BC and only few indications for their internal chronological division are available so far. But it seems likely that the above named grave finds including the Cetina jugs represent a late phase. If these Cetina relations were already sufficient to establish a Bell Beaker periphery in this place and to connect the West Adriatic shoreline with the East Adriatic area to a single greater periphery, the case becomes more complicated as this syncretism is manifested in an additional record, on the one hand in nearly half a dozen find spots with sherds of genuine Bell Beakers and on the other hand in conspicuous applications of the Bell Beaker decoration idea to the indigenous Laterza pottery (Fig. 1b). Those genuine beaker sherds – namely those of a maritime Bell Beaker from the Grotta del Pipistrello Solitario near Lecce and similar maritime beaker fragments around the Tropea in Calabria among some others 25 – are in no instance associated with Bell Beaker settlements or their graves. In fact, they always appear as single sherds in settlement or cave contexts of the Laterza-Cellino San Marco group, probably around or shortly after 2500 BC. Evidently, the phenomenon cannot get truly established outside of the Italian Bell Beaker centres in northern Italy, Tuscany and western Sicily or a secondary centre along the Tyrrhenian Sea about as far as Latium. 26 No further Bell Beaker provinces arise. In contrast, we can identify isolated adoptions of the typical Bell Beaker decoration on local vessels in Abruzzo, Apulia and also Calabria. This is best shown by the beaker and jug forms of the Grotta Cappucini near Galatone (Lecce) in southern Apulia where burial pottery has been excavated from a 11 x 4 m wide chamber containing the skeletal remains of more than 300 individuals. Typical decoration in several horizontal bands, but filled with a richer variety of motives, and worked in incised technique should demonstrate – analogous to the development of the Bell Beakers in other Mediterranean provinces – that a younger age relative to the maritime phase is most likely. This view is supported by three new AMS-datings that range between 2500-2300 BC (2 sigma range). 27 Isolated vessels of this type can be added: Grotta Trinità near Ruffano (Lecce, Apulia), the findspot of Le Coste (Pescina, L'Aquila, Abruzzo) and the Valle de la Vibrata, also situated in Abruzzo. Similar syncretism of Bell Beaker elements on pottery regarded as local is displayed on comb-stamp decorated vessels from Capo Alfiere in Calabria and Tanaccia di Brisighella (Ravenna). 28 This far-flung distribution demonstrates that we have to imagine not an insular adoption of Bell Beaker decorative elements on indigenous pottery, but rather the emergence of a wider pattern of syncretistic relationships. Taking all chronological indications together, it appears – although here only in part supported by absolute datings – that different Bell Beaker elements reflect a certain sequence: At the beginning single maritime beaker sherds stand, yet not constituting an independent Bell Beaker province in south and southeast Italy, but exercising an impact on the native cultures resulting in the mentioned syncretistic pottery forms; Italian Cetina should then be the most recent of those Bell Beaker influences with the stamp and puncture decorated vessels preceding the classic Cetina phase and its typical framed decoration. As the syncretistic cultures Iwno/Trzciniec and ESKK have already been termed the northeastern periphery of the Bell Beaker phenomenon by the Polish colleagues, it seems appropriate to summarise the archaeological cultures and groups adjoining to the south – Pitvaros/Maros, Proto-Cetina/Cetina and Laterza-Cellino San Marco – and among those especially syncretistic artefacts as from the Grotta Cappuccini – as a southeastern periphery of the Bell Beaker phenomenon. A glance at their distribution presents a fairly regular spacing between the respective centres, whereby it does not matter if they belong to the East Group or the Italian Bell Beaker groups. Geographically they are located on a string from north to south between the 15th-20th degree of eastern longitude. Equally remarkable is the dating of their emergence, as repeatedly discussed above, commencing 100-200 years after the core centres that have been assigned a date around 2500 BC. In the peripheries, good observability of the different Bell Beaker elements – both materially and ritually – is given and their geographic structures are comprehensible. This is less true when leaving the cores and their adjoining peripheries. It seems reasonable, as the impulse emitted by the cores and locally converted by the peripheries should diminish the further it goes east or southeast. Thus, it becomes more and more difficult to decide if one is really dealing with Bell Beaker elements. Two examples may illustrate this important point: Firstly, the situation in the eastern Baltic/Belarus area mentioned above, with parts of today's Ukraine affiliated, where the typical comb-stamp technique in pottery decoration overlaps with parallel traditions among the foraging Pitted Ware as well as related forest steppe societies of the third millennium BC. Secondly, there are the lithic wristguards, particularly two-holed or partially fractured ones, that presumably have had different functions (e.g. whet-/polish-/touchstones) and that not everyone would a priori associate with the Bell Beaker phenomenon. This is even more relevant for ‘imitations’ worked in a different material. Therefore, one must act with caution. In contrast, there are isolated Bell Beaker elements in Slovakia and Hungary that are located between cores of the Eastern group, namely in Moravia and around Budapest, or the here defined peripheries. They indicate that not only the distance to the cores is crucial, but that above all the mode of reception and adaptation by the cultural substratum is decisive. In addition to the Hungarian finds, particularly single wristguards, a recently published article by J. Bátora et al. 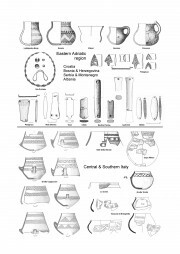 (2003) 30 gives a good overview considering the wide distribution range of the accompanying pottery, wristguards, flint arrowheads and certain bone pendants in southwestern Slovakia. Romania is evidently rich in Bell Beaker elements (Fif. 2a). 31 They appear in western and southern Transsylvania, as well as more south in Oltenia. Comb-stamp decorated vessels in Leliceni and Feldioara can be mentioned, the latter possibly a rim sherd of a genuine Bell Beaker. Moreover, sherds with horizontal zoned decoration from caves in Igriţa and Izbîndiş, jud. Bihor, and similarly horizontal zoned decorated pottery, partly in beaker-like shapes from the Oltenian sites of Govora-Sat, Odaia Turcului and Bogdăneşti that are subsumed as Runcuri type associated with a late Glina; they have already been related to the Bell Beaker phenomenon by Romanian colleagues. However, their resemblance to some younger Vučedol forms should be emphasised. Furthermore, from the same cultural background of Oltenia derive conspicuous flat-oblong/oval and several times perforated clay objects that could be interpreted as imitations of the ‘wristguard-idea’ in clay. 32 Comparable to the wristguards made of bone – known from the Baltic region, and also being found in Leliceni – they could be regarded as a faint reflection of this eminent symbol and sign of affiliation, but in an area where such compromises on the material are possible. Further to the south, of course, the finds from Ostrikovac at the Serbian Morava river have to be cited. 33 In the layer Id of a tell-like settlement site fragments of several genuine Bell Beakers have been retrieved, among those an almost complete specimen. They were termed ‘technologically foreign’ by the excavator M. Stojić, but are clearly identifiable as metope decorated beakers of the East Group. The congruence is so well that they could, for instance, be determined as a classic example of my ‘Bechergruppe 3a’ in Southern Germany, leading find of the phase A2a. 34 Therefore, they could be dated with some precision to c. 2400 BC or slightly later. As if the remarkably good preservation for a settlement site and the great distance of several hundred kilometres to the nearest graves of the East Group were not curious enough, matters become fully problematic considering the find context in Ostrikovac. For layer Id represents a younger Vučedol with some cord decoration and relations to Coţofeni III. Speaking of absolute chronology, I would date this context about 200 years older than the Bell Beaker vessels. Of course, the possibility remains that later pits dug in layer Id – or even graves – have been overlooked. Anyway, some uncertainty remains. Further to the south, now in the central Mediterranean region, certainly Albania with its Cetina finds as those of Shkrel, as well as also Malta 35 belong to the same marginal area of Bell Beaker presence where for the latter against the cultural background of the ‘cremation cemetery’ of Tarxien V-buttons made of Spondylus shell and horizontal band-like decorated beaker-like vessels can be cited. Of central importance for our problem outlined above concerning the connection of the Bell Beaker phenomenon with the Aegean Early Bronze Age are, however, marginal finds from Greece and particularly from the Peloponnese (Fig. 2b). The key site is Olympia in the Elis, but more recently Andravida-Lechaina, as well as Lerna in the Argolis have also acquired this status. 36 J. Maran had already pointed out the special relations between the indigenous EH III and the Dalmatian Cetina culture. 37 Along with the Cetina finds from Italy and Albania summarised above, a far-reaching and self-contained Early Bronze Age culture emerges in the Adriatic-Ionian region; one that adopts a key position for the further expansion of Early Bronze Age structures in Europe. 38 But the Bell Beaker connections that are under closer examination here should not be overestimated for the EH III/Cetina material. Apparently, the majority of finds – double handled forms sparsely decorated or showing remains of the typical framed decoration mostly in an incised technique – belong to a younger phase of EH III which exceeds the occurrence of the Bell Beaker elements in terms of chronology. Merely one stamp decorated bowl from Olympia associated with the oldest EH III strata there 39 by its decoration on the broadened rim as well as in a zoned band below indicates a relationship with similar stamp and puncture decorated plates and bowls from Italy and Dalmatia for which we have just suggested Bell Beaker connections. So far we have been concerned with the cultural setting of EH III, but two notable sherds even appear in an EH II context. One of these is from Lerna IIIb, the other an older find from Eutresis. 40 Both are small wall sherds and furnished all over with a comb-stamp or similar impressions by using a shell. Motives or even patterns cannot be discerned. On all accounts, they represent no genuine Bell Beakers. Still, they are both to be regarded as alien in the generally rather plain EH II pottery inventory. But without autopsy and archaeometric analysis it cannot be decided if this is really to be regarded as a faint reflection of the typical Bell Beaker decoration. Chronologically, it seems feasible; indeed, the closest fit would be the early ‘maritime’ western and central Mediterranean horizon of expansion around 2500 BC. It is a tempting thought, if the stone objects from the Tholos grave of Platanos in the Messara plain on Crete are also part of that connection, but one difficult to prove considering the long duration of the grave from EM I to MM. 41 Under those circumstances I would merely be inclined to regard the four-holed stone plate as a wristguard whereas for the majority of the two-holed plates at hand the mentioned restrictions of functional and cultural assignment apply. Going back to the title of this contribution and, moreover, to the concern of this whole conference it should have become clear that marginal Bell Beaker elements of the mid-third millennium BC have reached the Aegean, whether or not one accepts the comb-stamp decorated sherds dating to EH II from Lerna and Eutresis, as well as the ‘wristguards’ from Crete – or relies on the Cetina finds from the Peloponnes alone. In no instance, though, could the phenomenon gain ground and trigger an independent Bell Beaker development. The incentives were too few, the ideology not persuasive enough, the distance to the nearest core too large and, in the case of Cetina, the arrival in southern Greece apparently ‘too late’. Therewith, only one side of the interrelation between the Bell Beaker phenomenon and the Aegean Early Bronze Age is recorded here. But there was no intention – nor the space – to trace and evaluate the finds and findings of Aegean provenance of the third millennium BC in the central Mediterranean distribution area of the Bell Beaker phenomenon. This applies primarily for Malta, Sicily, Apulia and also Dalmatia, but possibly even beyond that. The Bell Beaker Eastern group and the north Italian Beaker groups as core areas of the phenomenon from about 2500 BC on, cohesively distributed as far as the 15th degree of eastern longitude. Indeed, the Rhenish/Dutch Bell Beaker province in its role as transmitter of impulses for the North, as well as the one in western Sicily for the South have to be counted among those cores. Adjacent to that in a zone north to south roughly between the 15th to the 20th degree of longitude the ‘syncretistic’ cultures of Iwno/Trzciniec, ESKK, Pitvaros/Maros, Proto-Cetina/Cetina and Laterza-Cellino San Marco (Grotta Cappuccini); as cultural peripheries of the phenomenon their beginnings succeed that of the cores by about 100-200 years. They adopt different components of the Bell Beaker ideology and the package in its repertoire, respectively, transforming it together with parts of their own traditional inventory to build a new identity. Isolated finds of genuine Bell Beakers in adjoining cultures, encountered here as marginal elements. In no instance an own Beaker group or such a periphery emerges. Further marginal areas where only single elements of the Bell Beaker phenomenon are recognisable, such as the typical pottery decoration (bands, zones, comb-stamp) or the wristguards, some of them worked in unusual materials. The two latter stages partly reach far beyond the periphery and can be traced as far as the 25th degree of eastern longitude in Eastern Europe – albeit with big question marks. In no case are they able to trigger a new development. At first glance, this distribution appears to reflect a classical geographically staggered core/periphery/margin-model. However, this would miss out the dynamic which has to be regarded as far more complex. Not only do the cores interact with each other; the peripheries can also draw on several cores; engaged in mutual exchange those ‘syncretistic cultures’ represent independent developments with a new identity that will later lead the way of the Early Bronze Age. Thus, peripheries turn into new cores of the following development in that they exert influence and interact with their environment. Furthermore, the margins have their own dynamics, presumably being early (failed) attempts to promote elements of the package and, in particular, the ideology behind it. But there are marginal areas between the peripheries, too; or as in the case of Western Europe 42 – which has not been considered here – even between the cores, not only reflecting the distance to the nearest cores, but each with very diverse forms of reception and adaptation. In fact, we encounter two or possibly more levels and functions that overlap and interfere. This picture more closely resembles a model of a multi-polar network between different, perhaps even hierarchically structured centres of communication. Therefore, it only appears to be a core/periphery/margin-system, for the impulse has its given geographical propagation from west to east and diminishes the further it advances. In a diachronic perspective it is likely to be eventually a matter of failed attempts to carry on the Bell Beaker ideology and package that first developed on the Iberian peninsula and then expanded into far-flung parts of the central continent to embrace areas far away from the last centre of communication. At the beginning of this contribution, the Bell Beakers were portrayed as a West European phenomenon. Unprecedented in European prehistory, that movement succeeds in reaching out to the far east and southeast – in regions like the Northern European plain, the Carpathian basin, the Western Balkans and the central, presumably even the eastern Mediterranean; regions that had never before engaged in direct contact with the continental West. Later, perhaps in the context of the so-called Sea Peoples at the ending second millennium BC, but certainly during the Celtic Migration we encounter episodic reversals of the southeast/northwest-directed cultural drift 43 which has prevailed on the continent ever since the Neolithisation and which is also mirrored in most presentations of this conference. It speaks in favour of the internationality of the third millennium BC and particularly its third quarter – when as an antipode to the East Mediterranean the ‘international spirit’ so neatly described by Colin Renfrew 44 arrives at its climax and the Bell Beaker phenomenon strives for its widest expansion – that two worlds so different from each other meet, whereby the West is representing the past of ideologies just expiring, while the Early Bronze Age of the southeast is about to seize Europe shaping its history as it goes on. 1 R.J. HARRISON and V. HEYD, “The Transformation of Europe in the Third Millennium BC: the example of ‘Le Petit-Chasseur I + III’ (Sion, Valais, Switzerland)”, PZ 82/2 (2007), 129-214; V. HEYD, “Soziale Organisation im 3. Jahrtausend v. Chr. entlang der oberen Donau: Der Fall Schnurkeramik und Glockenbecher“, Das Altertum 49/3 (2004) 183-214. 2 F. NICOLIS (ed. ), Bell Beakers Today. Pottery, people, culture and symbols in prehistoric Europe. International Colloquium Riva del Garda (Trento, Italy), 11-16 May 1998 (2001); J. GUILAINE, “Les Campaniformes et la Méditerranée”, in Substrats et genèse(s) du Campaniforme, Actes de la séance de la SPF du 21 février 2003 (Bulletin de la Société Préhistorique Française 101/2, 2004) 239-249; L. SALANOVA, “Le role de la façade atlantique dans la genèse du Campaniforme en Europe“, in ibid., 223-226; H.J. CASE, ”Beakers and the Beaker Culture”, in J. CZEBRESZUK (ed. ), Similar but Different. Bell Beakers in Europe (2004) 11-34. 3 C. BURGESS and S.J. SHENNAN, “The Beaker Phenomenon: some suggestions”, in C. BURGESS and R. MIKET (eds. ), Settlement and Economy in the Third and Second Millennia BC (BAR British Series 33, 1976) 309-331; HARRISON and HEYD (supra n. 1). 4 My thank are going to Margarete Schlosser for helping me translating this paper originally written in German, and to Richard J. Harrison for helpful comments and polishing up the English manuscript. 5 J. CZEBRESZUK, “The North-Eastern Borderland of the Bell Beakers. The Case of the Polish Lowland”, in M. BENZ and S. VAN WILLIGEN (eds. ), Some New Approaches to the Bell Beaker “Phenomenon”. Lost Paradies…? (BAR IS 690, 1998) 161-178; J. CZEBRESZUK and M. SZMYT, “The Bell Beaker Influences on the North European Plain”, in NICOLIS (supra n. 2) 459-470; see in particular the papers of CZEBRESZUK and SZMYT (p. 1-2), CZEBRESZUK (p. 21-38), CZEBRESZUK and KRYVALCEVICZ (p. 107-116), SOBIERAJ (p. 117-122), LOZE (p. 123-136), MAKAROWICZ (p. 137-154) and CZEBRESZUK and SZMYT (p. 283-287) in J. CZEBRESZUK and M. SZMYT (eds. ), The Northeast Frontier of Bell Beakers. Proceedings of the symposium held at the Adam Mickiewicz University, Poznan (Poland), May 26-29 2002 (BAR IS 1155, 2003); J. CZEBRESZUK and M. KRYWALTSEWITSCH, “Der Dolch aus Mesha, nördliches Weissrussland: Glockenbechereinflüsse in Osteuropa”, Archäologisches Korrespondenzblatt 33 (2003) 51-56; P. MAKAROWICZ, “The constrcution of social structure: Bell Beakers and Trzciniec complex in north-eastern part of Central Europe”, Przeglad Archeologiczny 51 (2003) 123-158; CZEBRESZUK (supra n. 2). 6 H. VANDKILDE, “Beaker Representation in the Danish Late Neolithic”, in NICOLIS (supra n. 2) 333-360; see also the papers of LIVERSAGE (p. 39-50), MERTENS (p. 51-72) and RASSMANN (p. 85-100) in CZEBRESZUK and SZMYT (supra n. 5). 7 J. CZEBRESZUK, “Finds of archer’s wristguards in the Baltic zone”, in S. KADROW (ed. ), A Turning of Ages. Jubilee book dedicated to Professor Jan Machnik on his 70th anniversary (2000) 157-172. 8 P. MAKAROWICZ, Rola spolecznosci kultury iwienskiej w genezie trzcinieckiego kregu kulturowego (2000-1600 BC) (1998); ID., “The constrcution of social structure: Bell Beakers and Trzciniec complex in north-eastern part of Central Europe”, Przeglad Archeologiczny 51 (2003) 123-158. 9 Previously also named as ‘Chłopice-Veselé’; in southern Poland one can also find the term ‘Proto-/Early-Mierzanowice’; in the following I will make use of the abreviation ‘ESKK’ which derives from the form ‘Epi-schnurkeramische karpatenländische Kultur’, used in the original publication written in German: S. KADROW and J. PEŠKA, “Älteste frühbronzezeitliche Siedlungen in Mähren und der Anfang des epischnurkeramischen karpatenländichen Kulturkreises“, in J. BÁTORA and J. PEŠKA (eds. ), Aktuelle Probleme der Erforschung der Frühbronzezeit in Böhmen und Mähren und in der Slowakei (Archaeologica Slovaca Monographiae – Communicationes 1, 1999) 33-40; F. BERTEMES and V. HEYD, “Der Übergang Kupferzeit/Frühbronzezeit am Nordwestrand des Karpatenbeckens – kulturgeschichtliche und paläometallurgische Betrachtungen“, in M. BARTELHEIM, E. PERNICKA and R. KRAUSE (eds. ), Die Anfänge der Metallurgie in der Alten Welt. Euroseminar Freiberg/Sachsen, 18.-20. November 1999 (Freiberger Forschung zur Archäometrie und Kulturgeschichte 1, 2002) 185-228; J. BUDZISZEWSKI, E. HADUCH and P. WLODARCZAK, “Bell Beaker Culture in South-Eastern Poland”, in CZEBRESZUK and SZMYT (supra n. 5) 155-182. 10 J. ONDRÁCEK and L. ŠEBELA, Pohrebiste nitranské skupiny v Holešove (katalog nálezu) (Studie muzea kromerizska '85, 1985) 2-130. 11 Or also called ‘Perjamos’ culture; sometimes one can find the term ‘Óbéba-Pitvaros’: summarised in M. GIRIĆ, “Die Maros (Moriš, Mureš) – Kultur”, in N. TASIĆ (ed. ), Kulturen der Frühbronzezeit des Karpatenbeckens und Nordbalkans (Balkanološki Institut Sanu 22, 1984) 33-58; T. SOROCEANU, Studien zur Mureš-Kultur (Internationale Archäologie 7, 1991); J.M. O’SHEA, Villagers of the Maros. A portrait of an Early Bronze Age society (1996). 12 E. VOGT, “Die Gliederung der schweizerischen Frühbronzezeit“, in Festschrift für O. Tschumi zum 22. November 1948 (1948) 53-69; W. RUCKDESCHEL, Die frühbronzezeitlichen Gräber Südbayerns. Ein Beitrag zur Kenntnis der Straubinger Kultur (Antiquitas Reihe 2/11, 1978). 13 L. BENDE and G. LÖRINCZY, “Kora bronzkori temetö és település a Kiskundorozsmai Hosszúhát-halmon”, Móra Ferenc Múzeum Évkönye – Studia Archaeologica 8 (2002) 77-107; for the wristguards: R. SCHREIBER-KALICZ, “Komplex der Nagyrév-Kultur”, in TASIĆ (supra n. 11) 133-190; K. TÓTH, “Kora bronzkori leletek Bács-Kiskun megyéböl”, Móra Ferenc Múzeum Évkönye – StudArch 4 (1998) 55-80; ‘Mezökomaron’: R. KALICZ-SCHREIBER, “Einige Probleme der Frühbronzezeit in Budapest und Transdanubien”, Acta Archaeologica Academiae Scientiarum Hungaricae 27 (1975) 287-296; ‘Börzcönce’: M. BONDÁR, “Early Bronze Age settlement patterns in South-West Transdanubia”, Antaeus 22 (1995) 197-268. 14 I. MAROVIĆ and B. ČOVIĆ, “Cetinska kultura”, in A. BENAC (ed. ), Praistorija jugoslavenskih zemalja, IV. Bronzano doba (1983) 191-231; B. GOVEDARICA, Rano bronzano doba na području istočnog Jadrana (Centar za balkanološka ispitivanja 7, 1989); P. DELLA CASA, “The Cetina group and the transition from Copper to Bronze Age in Dalmatia”, Antiquity 69 (1995) 565-576; ID., Velika Gruda II. Die bronzezeitliche Nekropole Velika Gruda (Opš. Kotor, Montenegro). Fundgruppen der mittleren und späten Bronzezeit zwischen Adria und Donau (Universitätsforschungen zur Prähistorischen Archäologie 33, 1996); M. PRIMAS, Velika Gruda I. Hügelgräber des frühen 3. Jahrtausends v.Chr. im Adriagebiet – Velika Gruda, Mala Gruda und ihr Kontext (Universitätsforschungen zur Prähistorischen Archäologie 32, 1996); J. MARAN, Kulturwandel auf dem griechischen Festland und den Kykladen im späten 3. Jahrtausend v. Chr. Studien zu den kulturellen Verhältnissen in Südosteuropa und dem zentralen sowie östlichen Mittelmeerraum in der späten Kupfer- und frühen Bronzezeit (Universitätsforschungen zur Prähistorischen Archäologie 53, 1998), in particular pp. 307-355; T. KAISER and S. FORENBAHER, “Adriatic sailors and stone knappers: Palagruža in the 3rd millennium BC”, Antiquity 73 (1999) 313-324. 15 D. GLOGOVIĆ, “Nalazi prapovijesnoga zlata iz Dalmacije i Hrvatskog primorja”, Prilozi Instituta arheologiju u Zagrebu 20 (2003) 27-32. 16 For the beaker-like vessels from the Ljubljansko Barje and Kenëte see: B. GOVEDARICA (supra n. 14). 17 B. ČEČUK and D. RADIĆ, “Vela špilja – Preliminarni rezultati dosadašnjih istraživanja”, Izdanja Hrvatskog arheološkog društva 20 (2001) 75-118; S. DIMITRIJEVIĆ, “Vučedolska kultura i Vučedolski kulturni kompleks”, in A. BENAC (ed. ), Praistorija jugoslavenskih zemalja, III. Eneolitsko doba (1979) 267-341; A. MILOŠEVIĆ and B. GOVEDARICA, “Otišić, Vlake – prethistorijsko nalazište u vrtači”, Godišnjak Centra za balkanološka ispitivanja 22 (1986) 51-71, e.g. T. V, 6-7. 18 T. KAISER and S. FORENBAHER, “Krajicina špilja i brončano doba otoka Visa (Krajicina Spilja and the Bronze Age of Vis)”, Opuscula Archaeologica (Zagreb) 26 (2002) 99-110. 19 S. FORENBAHER and T. KAISER, “Palagruža, jadranski moreplovci i njihova kamena industrija na prijelazu iz bakrenog u brončano doba“, Opuscula Archaeologica (Zagreb) 21 (1997) 15-28; KAISER and FORENBAHER (supra n. 14); see also the occurrence of knobbed and tanged protuberations otherwise typical for Italy on jug handles in Dalmatia: B. MARIJANOVIĆ, Prilozi za prapovijest u zaleđu jadranske obale (Filozofski fakultet Zadar, Monografie 2, 2000); e.g. Guvnine T. V, IX, XI/2, XII. 20 MARAN (supra n. 14) in particular pp. 364 ff. ; F. NICOLIS, “Long Distance Cultural Links between Northern Italy, the Ionian Islands and the Peloponnese in the Last Centuries of the 3rd Millennium BC”, in EMPORIA (2005) 527-538. 21 ‘Corazzo-Zungri’: D. MARINO and M. PACCIARELLI, “Calabria“, in D. COCCHI GENICK (ed. ), L’Antica età del Bronzo in Italia. Atti del congresso nazionale. Viareggio, 9-12 gennaio 1995 (1996) 147-162; for the inland sites see: NICOLIS (supra n. 20) 536, footnote 93; 'Montesei di Serso’: R. PERINI, “Il deposito secondario n. 3 dei Montesei di Serso. Contributo alla conoscenza del Bronzo Antico nella regione Trentino – Alto Adige”, Preistoria Alpina 8 (1972) 7-30. 22 The finds are coming from the Grotte di Caterina, dei Ciclami, Cotariova, del Gigante, del Mitreo, delle Ossa, Tartaruga and degli Zingari: B. GOVEDARICA, “Funde der Cetina-Kultur in den Grotten im Karst von Triest”, Balcanica 23 (1992) 319-328; E. GILLI and E. MONTAGNARI KOKELJ, “La grotta dei Ciclami nel Carso Triestino (materiali degli scavi 1959-1961)”, Atti della Società per la Preistoria e Protostoria Friuli-Venezia Giulia 7 (1993) 65-162; L. BARFIELD, “The Moser collection in the Naturhistorisches Museum, Vienna”, Atti della Società per la Preistoria e Protostoria Friuli-Venezia Giulia 11 (1997-1998) 19-62. 23 F. BIANCOFIORE, “La necropoli eneolitica di Laterza: Origini e sviluppo dei gruppi ‘protoappenninici’ in Apulia”, Origini 1 (1967) 195-300; L. CATALDO, “La tomba di Casal Sabini e i rinvenimenti funerari tra eneolitico ed età del Bronzo nel territorio di Altamura (Bari): le facies culturali indigene e i contatti transadriatici e con il Mediterraneo orientale”, Origini 20 (1996) 109-164; MARAN (supra n. 14). 24 For ‘Laterza-Cellino San Marco’: MARAN (supra n. 14); NICOLIS (supra n. 20) 534, footnote 73; ‘Conelle’: A. CAZZELLA, “Capitolo X. Conelle di Arcevia nel panorama culturale della preistoria del Mediterraneo centro-orientale e della penisola balcanica tra quarto e terzo millennio”, in A. CAZZELLA and M. MOSCOLONI (eds. ), Conelle di Arcevia. Un insediamento eneolitico nelle Marche, II (1999) 541-568. 25 ‘Grotta del Pipistrello Solitario’: D. COPPOLA, “Dal Neolitico all’età dei metalli in Italia sud-orientale: nuovi rinvenimento nel Salento“, Atti della Società per la Preistoria e la Protoistoria del Friuli Venezia Giulia 13 (2001-2002) 111-135; ‘Tropea’: D. COCCHI GENICK, “Le evidenze del Campaniforme in Calabria nell’ambito dei processi della comunicazione culturale dal tardo eneolitico al bronzo antico nell’Italia meridionale”, in Atti della XXXVII riunione scientifica: Preistoria e protostoria della Calabria, Scalea, Papasidero, Praia a Mare, Tortora 29 settembre – 4 ottobre 2002, Vol. I (2004) 310 ff. ; further finds are named in F. RADINA, “Santa Candida”, in G. ANDREASSI and F. RADINA (eds. ), Archeologia di una città: Bari dalle origini al X secolo (1988) 161-162; M.A. FUGAZZOLA DELPINO, “Prezense ‘campaniformi’ nell’Italia centro-meridionale”, in F. NICOLIS and E. MOTTES (eds. ), Simbolo ed enigma: il bicchiere campaniforme e l’Itzalia nella preistoria europea del III millennio a.c., catalogo, la Rocca di riva del Garda, 12 maggio – 30 settembre (1998) 155-160; V. D’ERCOLE and M. PENNACCHIONI, “Il Campaniforme in Italia centrale: Lazio ed Abruzzi”, in NICOLIS (supra n. 2) 667-669. 26 See contributions in NICOLIS and MOTTES (supra n. 25); F. NICOLIS (supra n. 2). 27 E. INGRAVALLO (ed. ), Grotta Cappuccini (Galatone) tra eneolitico e primo bronzo (2002); G. QUARTA, L. CALCAGNILE, M. D’ELIA, A. RIZZO and E. INGRAVALLO, “AMS radiocarbon dating of «Grotta Cappuccini» in Southern Italy”, in Nuclear Instruments and Methods in Physics Research Section B: Beam Interactions with Materials and Atoms. Proceedings of the Ninth International Conference on Accelerator Mass Spectrometry, 223-224 (2004) 705-708. 28 ‘Trinità’: G. CREMONESI, “Gli scavi nella Grotta della Trinità (Ruffano, Lecce)”, Quaderni de ‘La ricerca scientifica’ 100 (1978); ‘Le Coste’: A. BERTON, “Le Coste (Pescina, L’Aquila): Il livello eneolitico”, in Atti della XXXVI riunione scientifica: Preistoria e protostoria dell’Abruzzo, Chieti – Celano 27-30 settembre 2001 (2003) 633-636; ‘Vibrata’: FUGAZZOLA DELPINO (supra n. 25); ‘Capo Alfiere’: COCCHI GENICK (supra n. 25); ‘Tanaccia’: MARAN (supra n. 14). 29 E. KAISER, Studien zur Katakombengrabkultur zwischen Dnepr und Prut (Archäologie in Eurasien 14, 2003). 30 J. BÁTORA, K. MARKOVÁ and J. VLADÁR, “Die Glockenbecherkultur im Kontext der kulturhistorischen Entwicklung in der Südwestslowakei”, in CZEBRESZUK and SZMYT (supra n. 5) 255-264. 31 ‘Leliceni’: P.I. ROMAN, A. DODD-OPRITESCU and P. JANOS, Beiträge zur Problematik der schnurverzierten Keramik Südosteuropas (Internationale Kommission zur Erforschung der Vorgeschichte des Balkan 3, 1992); F. BERTEMES, “Überlegungen zur Datierung und Bedeutung der schnurverzierten Keramik im nördlichen Karpatenbecken und Siebenbürgen“, in B. HÄNSEL and J. MACHNIK (eds. ), Das Karpatenbecken und die osteuropäische Steppe (Südosteuropa-Schriften 20 = Prähistorische Archäologie in Südosteuropa 12, 1998) 191-209; 'Feldioara’: N. BOROFFKA, R. BOROFFKA, D. CĂPĂŢÂNĂ, A. IONIŢĂ and A. POPESCU, Feldioara-Marienburg. Contribuţii arheologice la istoria Ţării Bârsei / Archäologische Beiträge zur Geschichte des Burzenlandes (2004); ‘Igriţa’ and ‘Izbîndiş’: I. EMÖDI, “Ceramică ornamentată cu şnur din peşterile Igriţa si Izbîbndiş (jud. Bihor)“, Acta Musei Napocensis 24/25 (1987/88) 485-505; ‘Runcuri type’: R. BĂJENARU, “Die Keramik vom Typ Runcuri und die Frage der Gliederung der Glina Kultur“, in C. KASCÓ (ed. ), Bronzezeitliche Kulturerscheinungen im karpatischen Raum: Die Beziehungen zu den benachbarten Gebieten. Ehrensymposium für A. Vulpe zum 70. Geburtstag, Baia Mare 10.-13. Oktober 2001 (Bibliotheca Marmatica 2, 2003) 15-24; R. BĂJENARU, "Die Siedlung von Odaia Turcului und die südlichen Beziehungen der norddonauländischen Frühbronzezeit“, PZ 78/2 (2003) 140-155. 32 P. GOVORA, O Preistorie a nord-estului Olteniei (1995) 22 ff. 33 M. STOJIĆ, “L´énéolithique final dans le centre des Balkans”, in L. NIKOLOVA (ed. ), Early Bronze Age Settlement Patterns in the Balkans (CA. 3500-2000 BC, Calibrated Dates) (Reports of Prehistoric Research Projects, I, 2-4, 1996/97) 353-372; B. JOVANOVIĆ, “Technologie de la métallurgie du cuivre récent dans le Sud-est et l´Est de l´Europe”, in M.-C. FRÈRE-SAUTOT (ed. ), Paléometallurgie des cuivres. Actes du Colloque de Bourg-en-Bresse et Beaune, 17-18 oct. 1997 (Monographies Instrumentum 5, 1998) 85-87. 34 V. HEYD, Die Spätkupferzeit in Süddeutschland: Untersuchungen zur Chronologie von der ausgehenden Mittelkupferzeit bis zum Beginn der Frühbronzezeit im süddeutschen Donaueinzugsgebiet und den benachbarten Regionen bei besonderer Berücksichtigung der keramischen Funde (Saarbrücker Beiträge zur Altertumskunde 73, 2000). 35 Albania: B. JUBANI, “Kultura e bronzit të hershëm në tumat e Shkrelit”, Iliria 25/1-2 (1995) 53-90; F. PRENDI, “Les relations entre l’Albanie et l’Égée à travers la préhistoire”, in G. TOUCHAIS and J. RENARD (eds. ), L’Albanie dans l’Europe préhistorique, actes du Colloque de Lorient, 8-10 juin 2000 (Bulletin de Correspondence Hellénique, Supplément 42, 2002) 85-96; Malta: J.D. EVANS, The prehistoric antiquities of the Maltese islands: a survey (1971); e.g. beaker at pl. 53,9; V-buttons at pl. 37/11 and 44/2. 36 Listed in MARAN (supra n. 14); J. RAMBACH, “Bemerkungen zur Zeitstellung der Apsidenhäuser in der Altis von Olympia”, in R.M. BOEHMER and J. MARAN (eds. ), Lux Orientis. Archäologie zwischen Asien und Europa. Festschrift H. Hauptmann (Internationale Archäologie – Studia Honoria 12, 2001) 327-334; ID., “Olympia. 2500 Jahre Vorgeschichte vor der Gründung des eisenzeitlichen griechischen Heiligtums”, in H. VON KYRIELEIS (ed. ), Olympia 1875-2000. 125 Jahre Deutsche Ausgrabungen. Internationales Symposion, Berlin 9.-11. November 2000 (2002) 177-212; ID., “VI. Olympia im ausgehenden 3. Jahrtausend v.Chr. : Bindeglied zwischen zentralem und östlichem Mittelmeerraum”, in E. ALRAM-STERN (ed. ), Die Ägäische Frühzeit. 2. Serie: Forschungsberichte 1975-2002. 2. Band, Teil. 2: Die Frühbronzezeit in Griechenland (Veröffentlichungen der Mykenischen Kommission 21, 2004) 1999-2044; J.B. RUTTER, The Pottery of Lerna IV (Lerna, a preclassical site in the Argolid, III, 1995). 37 MARAN (supra n. 14) 307-355. 38 V. HEYD, “Entstehung und Etablierung frühbronzezeitlicher Strukturen in Europa“, in F. BERTEMES and H. MELLER (eds. ), Der Griff nach den Sternen – Wie Europas Eliten zu Macht und Reichtum kamen, Internationales Symposium Halle/Saale, 16.-21. Februar 2005 (in press 2008). 39 RAMBACH (supra n. 36, 2001). 40 M.H. 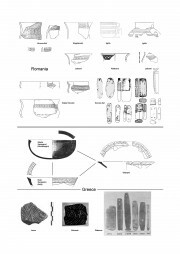 WIENCKE, The Architecture, Stratification, and Pottery of Lerna III (Lerna, a preclassical site in the Argolid, IV, 2000) 335, 576, plate 1, P42 (photo) and fig. II.71, P42 (drawing); Wiencke describes the sherd as a rim sherd of a lid (?) with a ’highly polished red surface’ (p. 335); H. GOLDMAN, Excavations at Eutresis in Boeotia (1931) 110, fig. 145/1-2; sherd no. 1 should be ‘covered with black glaze’, no. 2 with a red one; “rows of curved parallel lines composed of stippled impressions run obliquely towards the outer edge…”. 41 S. XANTHOUDÍDES, The vaulted tombs of Mesará. An account of some early cemeteries of southern Crete (1924) 104-105. 42 L. SALANOVA, “The frontiers inside the western Bell Beaker block”, in CZEBRESZUK (supra n. 2) 63-75. 43 ‘Sea People from a continental perspective’: K. KRISTIANSEN, The Rise of Bronze Age Society. Travels, Transmissions and Transformations (2005); ‘Celtic migration’: B. CUNLIFFE, The Ancient Celts (1997); ‘SE-NW-cultural drift‘: A. SHERRATT, Economy and Society in Prehistoric Europe: changing perspectives (1997); 'Early Bronze Age’: V. HEYD (supra n. 38). 44 C. RENFREW, The Emergence of Civilisation. The Cyclades and the Aegean in the 3rd Mill. BC. Studies in Prehistory (1972); MARAN (supra n. 14); J.C. BARRETT and P. HALSTEAD (eds. ), The Emergence of Civilisation Revisited (Sheffield Studies in Aegean Archaeology 6, 2004). Heyd, V. "When the West Meets the East. The Eastern Periphery of the Bell Beaker Phenomenon and Its Relation with the Aegean Early Bronze Age." 6 Mar. 2008. In: Horejs, B. - Pavúk, P. (eds. ): Aegean and Balkan Prehistory. http://www.aegeobalkanprehistory.net/index.php?p=article&id_art=10 (23 Apr. 2019).